When your dentist has recommended a dental crown, cost will be one of your first concerns. What does a dental crown cost? As with most things in life - it depends! There are many factors that are involved in the cost of a dental crown. Some are to do with the time and complexity of the dentist appointment. BUT MOSTLY, dental crown cost is to do with the MATERIAL that the crown is made of. Did you think that all crowns were made from the same material? That's not true. 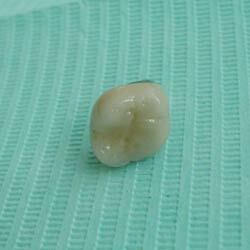 Here's a list of the most common types of crown material. Let's look at the reasons why you might want a particular type of crown, and how the material will affect the dental crown cost. 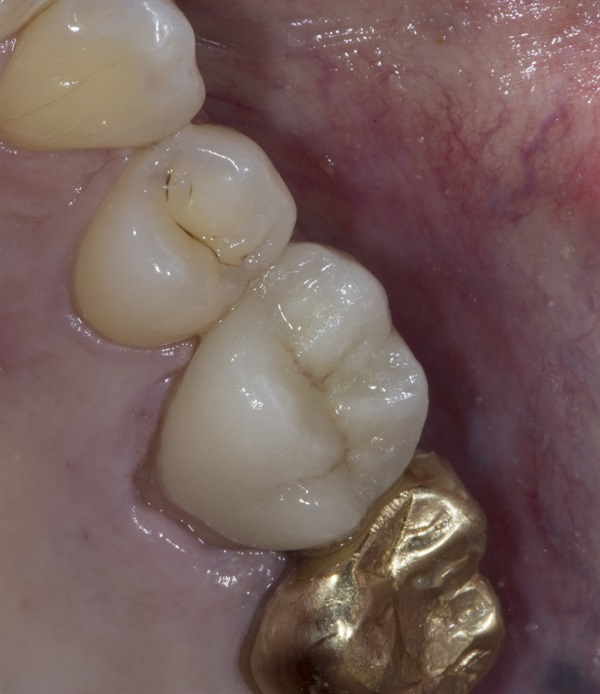 This could be considered a title old-fashioned, but there is absolutely no doubt that a full gold crown is the best option for the back molar teeth. It's because a gold crown can be REALLY thin. This means that the dentist only has to trim down your tooth a little bit. This is the MOST conservative type of crown! All other types of crown require the dentist to trim the underlying tooth down more. Also, the gold alloy is extremely strong, but at the same time it wears down at a rate slightly faster than tooth enamel. This means that it will not wear down the opposite tooth - the one it bites on. This is very important, because just about every other type of dental crown material WILL wear down the opposite tooth. The only disadvantage with a gold crown is the colour. Most folk would prefer NOT to have a "gold tooth". BUT if the gold crown is on your very last molar (ie. at the back), it will NOT be visible. 1. It's not a pure gold crown. It's an alloy, combined with other metals. So the gold content is relatively low. 2. The crown can be extremely thin, because it's so strong, and so the gold alloy content is low. 3. A full gold crown takes up the LEAST dental laboratory time. It's fast to make up, easy to trim and a dream to polish. Less dental laboratory time means lower dental crown cost! This crown material is most often used on molar teeth, too. It's a relatively new, recent development. Zirconia is technically a trans-metallic compound, but it is tooth-coloured. It is extremely strong, and has the nickname "ceramic steel". Although it is basically tooth-coloured, it doesn't really look like a tooth, because it's very opaque. It looks more like a chalky tooth. For this reason, it is best used on molar teeth at the back of the mouth. NOT on the very back molars, but the next ones forwards. The first molars. It is possible to improve the appearance of the zirconia crown by either painting the surface with tinted glazes, or by adding a layer of traditional dental porcelain ("ceramic") over the surface of the crown. This done if the teeth are more visible, towards the front of the mouth, and have to look like natural teeth. The disadvantages of zirconia crowns are that the construction process is complicated, time-consuming and requires special equipment. This makes zirconia dental cost relatively expensive, compared to other crowns. Also, if you get one with porcelain bonded to the surface to improve the appearance, there is the possibility of that surface layer coming off. Oddly, there is no chemical bond holding the normal porcelain onto the zirconia. It just stays on by micro-mechanical bonding, where the porcelain gets into all the microscopic nooks and crannies of the zirconia surface. This crown is basically a metal alloy cap or thimble that is then covered with dental porcelain to make it look like a tooth in shape and color. The technology to bond ceramic to a metal surface was first developed in West Germany in the 1960s, and used the initials VMK, which stands for "verbund metal keramik". This technology has been developed and improved over the years, and is now very reliable in terms of the porcelain staying on the crown, and also in terms of getting a natural tooth-like appearance. These crowns can be used on any teeth, front or back, and are pretty much "the standard" when it comes to getting crowns. This dental crown cost is the least to manufacture in the dental lab. This crown is used when we want to get as natural an appearance as possible. It is made by building up multiple layers of dental porcelain to create the look of a natural tooth. When comes to getting the layering right, this demands great skill from the dental technician. While this type of crown can look great, the main disadvantage is that it is not as strong as the other crowns listed above. It can really only be used on the front six teeth (the incisors and the canines or "eye teeth"). In the last 20 years we have been able to improve the way these crowns are fitted, by using dental bonding agents to create a true chemical bond between the tooth surface and the inside of the crown. This is just one trade name for crowns made from a material called "glass ceramic". It starts off in the dental lab as a glass, but when it is heated and cast into a tooth shape for a crown, it undergoes a process called "ceramicisation", and becomes a type of ceramic. This initially carried the promise of being very strong, while being tooth-coloured. Again, like Zirconia crowns, Empress crowns need to have the surface treated in some way, to get them look like a natural tooth. These crowns are made using the Cerec technique, invented in Switzerland by Prof. Mormann. This involves cutting-edge computer-aided design, with a miniature camera to get an image of the tooth to be restored, and a computerised dental milling unit to mill out the crown from a solid block of dental ceramic. You can read more about this technique at Cerec Veneers. 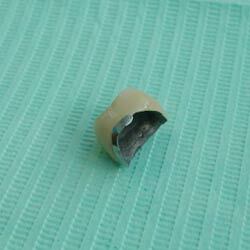 This not so much a material, but more a type of crown design to restore a root-filled tooth. You can read more at Root Canal Crown. Finally, there is the dental implant crown. As it's name implies, it is used to build up the final "tooth" on top of a dental implant. The technical details vary, depending on how the crown will be fitted to the implant, but in terms of basic materials, they are almost always porcelain bonded to metal crowns. What other factors affect dental crown cost? Where your dentist has his office. Obviously, it will be more expensive to get a crown in an up-market neighborhood or city center location. It's just a fact that rents are higher, wages for ancillary staff are higher, and so on. Which dental laboratory your dentist uses to get the crown made up. Some labs charge more than others, and it's usually a case of "you get what you pay for". Better labs will have better staff, who can command higher wages, and they will also have higher quality equipment, which can be very expensive when you're setting up a lab. The lab owner needs to get his investment back! So there are several factors that contribute to dental crown cost. Each type of material has it's own advantages and disadvantages; in general, my advice would be to stay away from cheap crowns. They will be cheaper for a reason.